Chef Scott Uehlein for Canyon Ranch Lenox in Lenox, Massachusetts in The Berkshires tempts the palate with his creative recipes for Chilled Cucumber and Arugula Soup; Strawberry, Chicken, and Arugula Salad; and Salmon with Blueberry Mango Salsa, proving that eating healthy does not have to mean boring menus. Bon Appétit! Canyon Ranch Lenox, located in The Berkshires in Western Massachusetts, is a highly respected destination resort spa, and in November 2009, Edward and I stayed at Canyon Ranch Lenox and had the opportunity to experience their award-winning delicious and healthy cuisine. Canyon Ranch's approach to cuisine is all about flavor and nutrition, and calories and nutritional information are listed on the menus instead of prices. 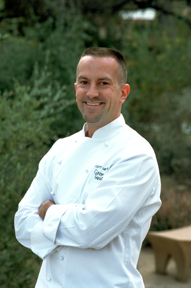 Chef Scott Uehlein is the corporate chef for the three Canyon Ranch properties, Tucson, Arizona, Lenox, Massachusetts, and Miami Beach, Florida, and has an impressive culinary background that includes training at the prestigious cooking school, The Culinary Institute of America located in Hyde Park, New York. He grew up in New Jersey, honed his culinary career working in New York, Washington DC, and Philadelphia, and later received additional training at Beringer Vineyard in California. From California, he and his wife moved to Sedona, Arizona where he worked for 6 years before joining Canyon Ranch in Tucson, Arizona in 2003. He is a frequent television guest promoting creative healthy cuisine, and he is also the co-author of the cookbook, Canyon Ranch Nourish, indulgently healthy cuisine by Scott Uehlein and Canyon Ranch. Living a healthy lifestyle is all about choices, and selecting balanced ingredients is a key component. His philosophy is not to reinvent classics by removing fat, but rather to build dishes from the ground up. Tricks of the trade include seasoning before cooking, not after; create a balance of sweet, sour, bitter, and salty; and buy local as the season dictates. As for culinary trends for the future, Chef Scott thinks that there will be more menu labeling noting nutritional values. When not working at developing new recipes, Chef Scott Uehlein enjoys spending time with his wife and three daughters ages 5 through 16, and also playing in his home garden. Chef Scott Uehlein's approach is to create recipes that are not only nutritionally beneficial, but are also attractive to the eye, and pleasing to the palate. He graciously shares three of his recipes from his cookbook for Chilled Cucumber and Arugula Soup; Strawberry, Chicken and Arugula Salad; and Salmon with Blueberry Mango Salsa. Chef's Note: Peppery arugula gives this soup a savory finish. Method: Combine cucumber, water, onion, lemon juice, garlic, salt, and pepper in a blender and puree until very smooth. Refrigerate in a covered bowl for at least 30 minutes or until well chilled. 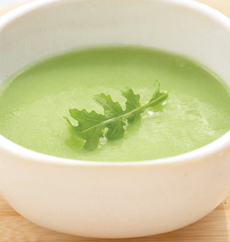 Serve ¾ cup of chilled cucumber soup with 1 teaspoon of cream and a sprinkle of arugula. Method: In a small bowl combine all ingredients for the dressing and set aside. Chef's Note: Three cups of croutons can be substituted for the multi-grain bread slices. Method: Preheat grill or broiler. Grill or broil chicken breast for 3 to 5 minutes on each side or until internal temperature reached 165° F (74° C). Cool completely and dice. Evenly spray bread with olive oil spray or brush with 2 tablespoons olive oil on both sides. Grill bread slices until toasted. Dice bread into bite-size pieces and set aside. 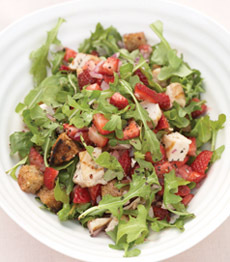 In a large bowl, combine chicken, strawberries, and arugula. Whisk dressing until well mixed. Toss salad with dressing and grilled bread just before serving. Divide salad into 4 servings and place in salad bowls. Nutrition note: Strawberries are an excellent source of vitamin C and antioxidants. Choose organic strawberries to minimize your exposure to pesticides and herbicides. Method: In a medium bowl combine all ingredients for the blueberry mango salsa. Lightly crush with a fork to release juices. Set aside. Method: Heat olive oil in a large sauté pan over medium high heat. Season salmon with salt and pepper and sear for 3 to 5 minutes on each side, or until salmon is cooked through. 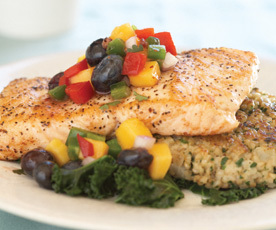 Serve each salmon fillet with ¼ cup of blueberry mango salsa. Nutrition note: Blueberries are rich in anthocyanins, which show potential for preventing glaucoma, heart disease, and cancer. A ripe mango has a sweet, fruity fragrance and its flesh is easily indented when pressed. Mangoes are rich in vitamins C and A and carotenoids. Salmon is a great source of disease-fighting omega-3 fatty acids. Chef's Note: Canyon Ranch usually serves this on their "Super Foods" dinner alongside an Oat Cake and Sautéed Kale. Read about Canyon Ranch Lenox in the Hotels and Resorts and Spas sections.